(Nanowerk News) An international group led by scientists at UCLA’s California NanoSystems Institute has developed a new method for effectively extracting and analyzing cancer cells circulating in patients’ blood ("Programming Thermoresponsiveness of NanoVelcro Substrates Enables Effective Purification of Circulating Tumor Cells in Lung Cancer Patients"). Circulating tumor cells are cancer cells that break away from tumors and travel in the blood, looking for places in the body to start growing new tumors called metastases. Capturing these rare cells would allow doctors to detect and analyze the cancer so they could tailor treatment for individual patients. 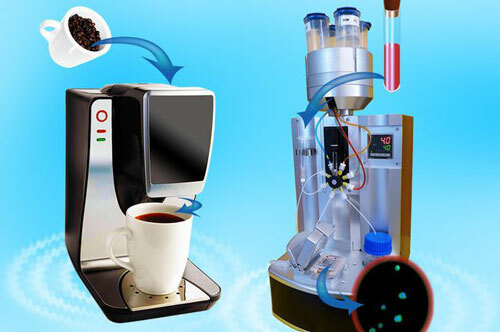 The device, developed at UCLA, enables scientists to control the blood’s temperature — the way coffeehouses would with an espresso machine — to capture and release the cancer cells in optimal conditions. In his laboratory at the UCLA California NanoSystems Institute, Hsian-Rong Tseng, a professor of molecular and medical pharmacology, used a device he invented to capture circulating tumor cells from blood samples. The device, called the NanoVelcro Chip, is a postage-stamp–sized chip with nanowires that are 1,000 times thinner than a human hair and are coated with antibodies that recognize circulating tumor cells. When 2 milliliters of blood are run through the chip, the tumor cells stick to the nanowires like Velcro. Capturing the tumor cells was just part of the battle, though. To analyze them, Tseng’s team needed to be able to separate the cells from the chip without damaging them. In earlier experiments with NanoVelcro, the scientists used a technique called laser capture microdissection that was effective in removing individual cells from the chip without damaging them, but the method was time-consuming and labor intensive, and it required highly specialized equipment. Now Tseng and his colleagues have developed a thermoresponsive NanoVelcro purification system, which enables them to raise and lower the temperature of the blood sample to capture (at 37 degrees Celsius) and release (at 4 degrees Celsius) circulating tumor cells at their optimal purity. Polymer brushes on the NanoVelcro’s nanowires respond to the temperature changes by altering their physical properties, allowing them to capture or release the cells. Because it could make extracting the cancer cells much more efficient and cost-effective at a time in a patient’s life when information is needed as quickly as possible, Tseng said it is conceivable that the new system will replace laser capture microdissection as the standard protocol.